This study uses the "simplified patterns of temperature and effective precipitation" approach from the Australian component of the international palaeoclimate synthesis effort (INTegration of Ice core, MArine and TErrestrial records – OZ-INTIMATE) to compare atmosphere–ocean general circulation model (AOGCM) simulations and proxy reconstructions. The approach is used in order to identify important properties (e.g. 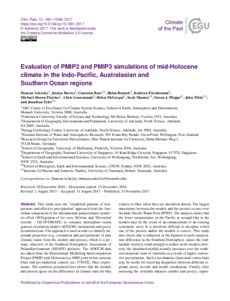 circulation and precipitation) of past climatic states from the models and proxies, which is a primary objective of the Southern Hemisphere Assessment of PalaeoEnvironment (SHAPE) initiative. The AOGCM data are taken from the Paleoclimate Modelling Intercomparison Project (PMIP) mid-Holocene (ca. 6000 years before present, 6 ka) and pre-industrial control (ca. 1750 CE, 0 ka) experiments. The synthesis presented here shows that the models and proxies agree on the differences in climate state for 6 ka relative to 0 ka, when they are insolation driven. The largest uncertainty between the models and the proxies occurs over the Indo-Pacific Warm Pool (IPWP). The analysis shows that the lower temperatures in the Pacific at around 6 ka in the models may be the result of an enhancement of an existing systematic error. It is therefore difficult to decipher which one of the proxies and/or the models is correct. This study also shows that a reduction in the Equator-to-pole temperature difference in the Southern Hemisphere causes the mid-latitude westerly wind strength to reduce in the models; however, the simulated rainfall actually increases over the southern temperate zone of Australia as a result of higher convective precipitation. Such a mechanism (increased convection) may be useful for resolving disparities between different regional proxy records and model simulations. Finally, after assessing the available datasets (model and proxy), opportunities for better model–proxy integrated research are discussed.